While the archery-only season kicks off this weekend and runs through Nov. 2, the general gun season opener is still more than a month away on Nov. 3. A special youth-only weekend season is set for Oct. 27-29. The general season runs through Jan. 6, 2019 in North Texas and Jan. 20, 2019 in South Texas. A late youth-only season is also slated for Jan. 7-20, 2019. For additional late season deer hunting opportunities and county specific regulations, consult the 2018-19 Outdoor Annual of hunting and fishing regulations. 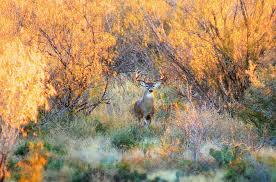 Hunters are also reminded to review the TPWD chronic wasting disease regulations for information about CWD testing requirements and carcass movement restrictions for the 2018-19 season. Also as a reminder, Texas hunters harvesting deer, elk, moose, or other susceptible species in other CWD-positive states must also comply with carcass movement restrictions when bringing those harvested animals back into Texas. Additionally, the Texas Animal Health Commission has mandatory testing requirements that apply to elk, red deer, sika, moose, and reindeer.